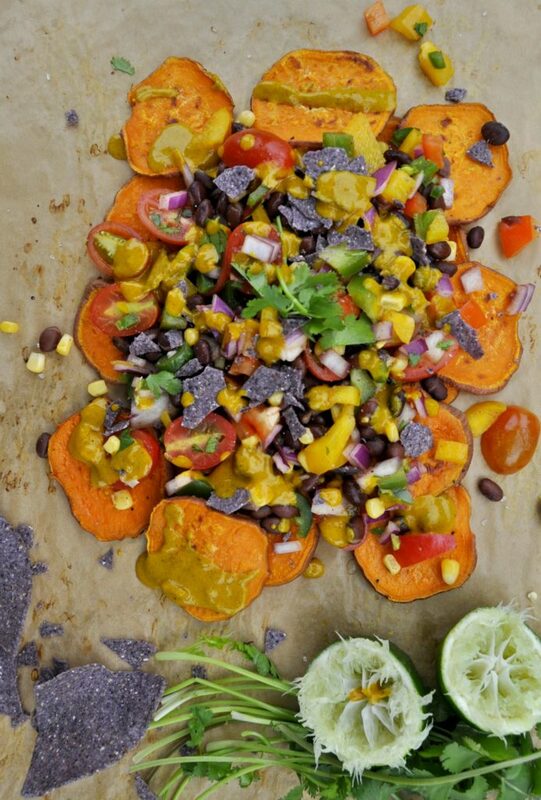 These nachos are piled high with a black bean cowboy caviar AKA Texas caviar. 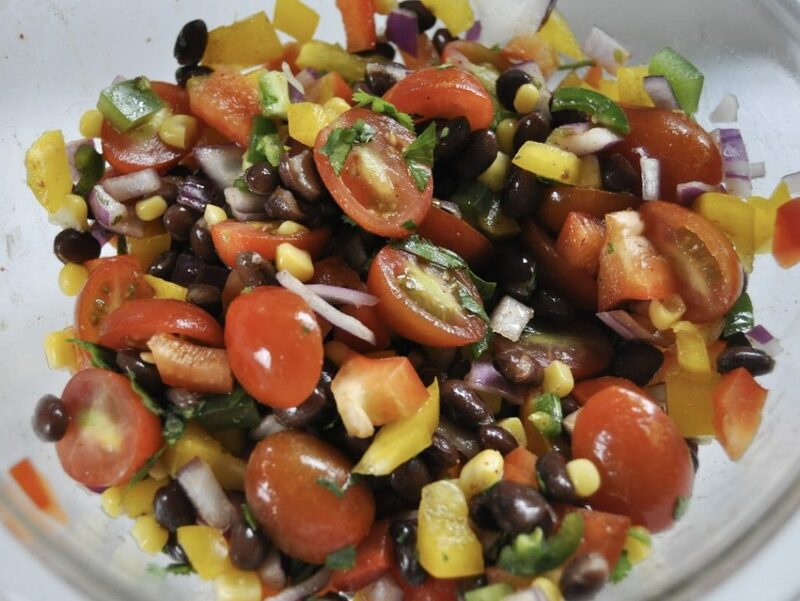 Ooh, the crunchy bell peppers and sweet red onion mixed with black beans, corn, and tomatoes. Filling and packed with nutrients! Usually cowboy caviar uses black eyed peas, but I subbed black beans for this recipe. Because black beans are always the best nacho topping. Black bean caviar is extremely versatile! You’ll find me using this black bean caviar as a taco filling, paired with quinoa for an easy lunch, or loaded on sweet potato nachos. It takes ten minutes to make and uses inexpensive and easy to find ingredients, so it’s a regular rotation through my kitchen. As always, the options are endless. 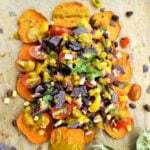 You can prepare the salsa while your sweet potatoes are roasting. I will always love nachos. You could possibly say that nachos are my vice. I mean, heck, you can put anything on nachos! 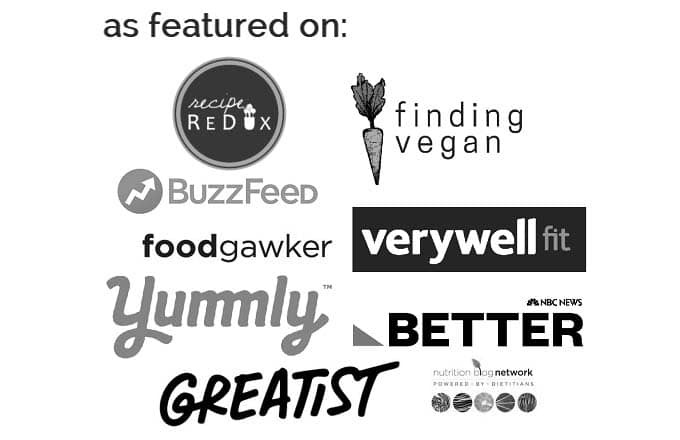 Black beans, roasted veggies, chipotle peppers, cashew cheese, on and on and on… catch me at my favorite bar on the weekends eating vegan nachos (which I honestly prefer over the real deal cheesy kind. But that’s another story entirely, for another nacho recipe). Naturally, I had to try out sweet potato nachos. 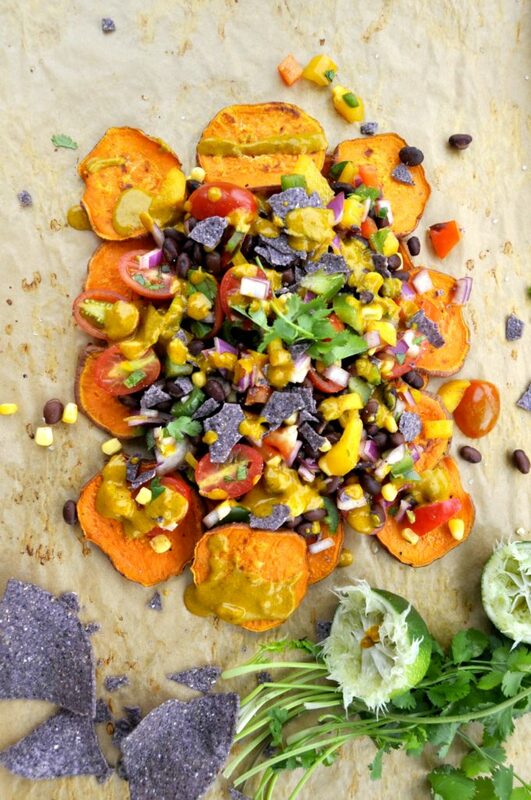 Replacing tortilla chips with roasted sweet potatoes is a major “YAY!” for health and flavor. 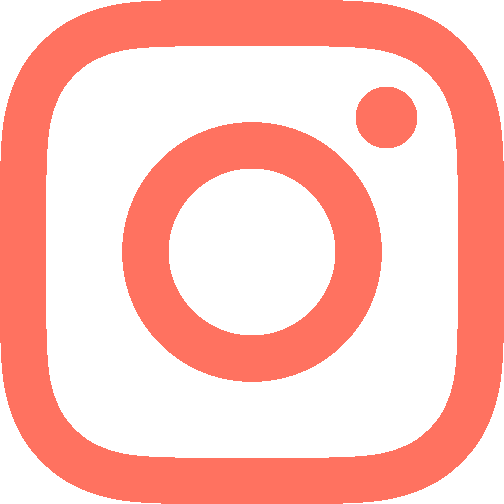 Just thinly slice three large sweet potatoes, toss them in a small bit of oil, and roast in the oven. The sweet potatoes crisp up beautifully in just about 25-30 minutes. 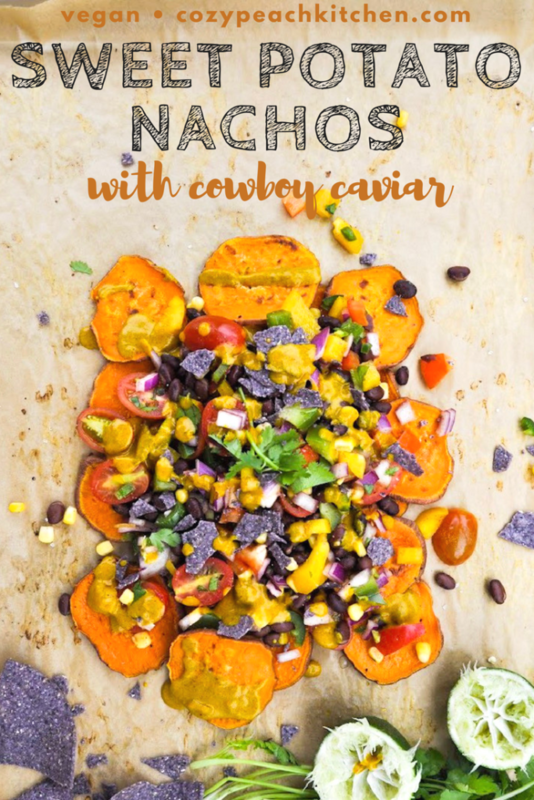 Load up the crispy sweet potatoes with black bean cowboy caviar and easy cheezey sauce and you’re ready for a filling, healthy vegan meal. 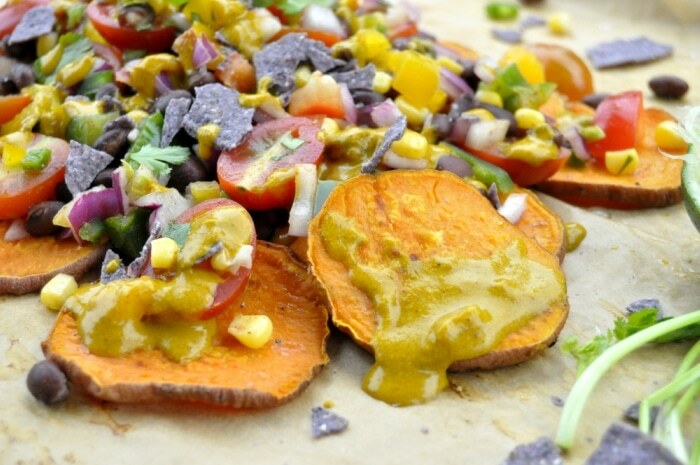 These sweet potato nachos are the perfect snack, appetizer, or dinner. Loaded with cowboy caviar inspired black bean salsa and optional vegan cheezey sauce. Preheat your oven to 425°F and line a large baking sheet with parchment paper. Set aside. Peel sweet potatoes if you prefer (I don't peel them - extra fiber and texture!). Slice the sweet potatoes as thin as you can, using a mandolin or chef's knife. In a large bowl, toss the sweet potatoes in oil. Sprinkle lightly with salt and pepper. Place the sweet potatoes in an even layer on the baking sheet. Bake in preheated oven for 20-25 minutes, flipping halfway through. Remove from oven when crispy. Top with cowboy caviar and cheezey sauce, if desired. Serve immediately with your favorite toppings. In a small bowl, mix together apple cider vinegar, agave syrup, lime juice, chili powder, and cumin. Combine remaining ingredients in a medium bowl. Stir in the apple cider vinegar mixture. Keeps for 5-7 days in a refrigerated container. *Regular vinegar can be substituted as needed.